"My mom has been making these since I was a kid, and they are the hit of every family get-together, from my brothers and sisters all the way down to the grandchildren; it is even spreading to my in-laws. Enjoy this family-favorite." Whisk 2 cups flour and salt together in a bowl. Cut shortening into flour mixture using a pastry blender or a fork until crumbly. Whisk water, eggs, and lemon juice together in a separate bowl; stir into flour mixture until dough forms a ball. Split dough into halves; roll each half into about a 9x13-inch rectangle. Press 1 rectangle into the bottom of a 9x13-inch baking dish. Place apple slices in a large bowl; add sugar, 3 tablespoons flour, and cinnamon. Toss apples to coat; spread over crust. 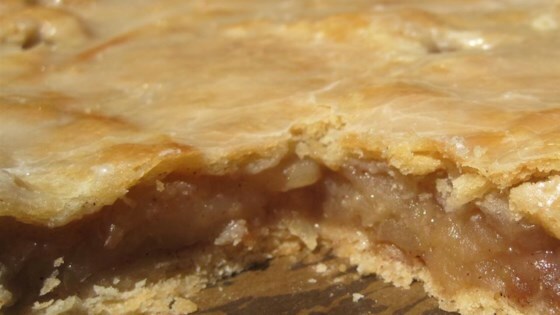 Cover apple filling with remaining crust, piecing together any scraps to cover any holes. Cut several slits into top crust for ventilation while cooking. Bake in the preheated oven until edges are browned and crisp, 45 minutes to 1 hour. Cool to room temperature before cutting into squares, about 30 minutes. Add a thin layer of corn flakes on top of bottom crust. It absorbs the liquid and saves the bottom crust from getting soft and mushy. I would let the apples sit for a few minutes to bring out the juice of the apples. I also changed the recipe to accommodate 18 servings so that it would fit in a jelly roll pan. Ate this still warm, my husband who loves apple pie said it was orgasmic! Best thing he had eaten and heis not a dessert person. Will make this again and again,super easy too! I was looking for this! Loved it as a kid, now I have to make it myself with out my mothers recipe. Made my own glaze for topping.